Cardiff Devils man of the match Joey Martin. Pic: Richard Murray. Write off this Cardiff Devils team at your peril. They were three goals down with two minutes 27 seconds left at Guildford Flames, but fought back to force the game into overtime. Mike Hedden (57-33), Mark Richardson (58-52) and Joey Martin (59-24) scored three goals in less than two minutes (111 seconds) to leave Flames gasping. Guildford recovered their composure to win in the penalty shootout, but Devils headed home delighted with a hard-earned point. It was an astonishing recovery by Elite League leaders Cardiff, who have an inner belief and work ethic which means they are always dangerous. Flames kept their nerve to win after overtime and penalties with Calle Ackered firing the crucial goal. The teams were level after the first group of penalties with Hedden scoring for Devils, but Flames edged it in sudden death. 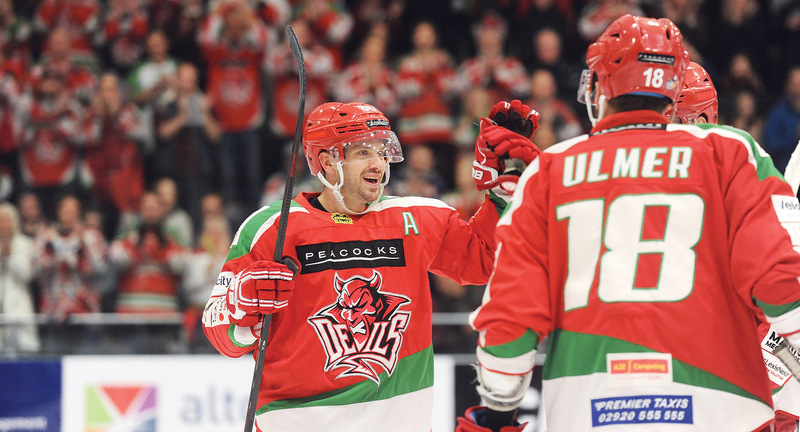 Devils welcomed back Layne Ulmer after his three-match suspension, while Joey Haddad played his second match in two nights after recovering from injury. The only absentee was Evan Mosey, who is still on the mend after a mid-ice hit left his prostrate on the ice. Welshman and former Devil Ben Davies, a former Bishop of Llandaff School pupil, and Canadian forward Brett Ferguson both finished with three points for Flames, who produced an intense team performance even though this was their third fixture in three days. On the same night Belfast Giants, the closest challengers to Devils, were beaten 3-2 at Nottingham Panthers after overtime. That means Cardiff remain top of the League with a game in hand on their second-placed rivals from Northern Ireland. Scorers, Flames: Ben Davies 1+2, Brett Ferguson 2+1, Jamie Crooks 0+1, Evan Janssen 0+1. Devils: Mike Hedden 1+0, Mark Richardson 1+0, Joey Martin 1+2, Matthew Myers 0+1, Gleason Fournier 0+1, Stephen Dixon 0+1, Sean Bentivoglio 0+1. Period scores (Flames first): 0-0; 2-0 (2-0); 1-3 (3-3); 0-0 (3-3); 1-0 on penalties (4-3). Shots on goal: Flames (on Bowns) 9+14+7=31; Devils (on Carrozzi) 8+11+18=37. Penalties in minutes: Flames 2+2+0=4; Devils 4+6+0=10. Special teams: Flames PK 2/2, PP 1/5; Devils PK 4/5, PP 0/2. Referees: Tom Darnell and Matt Rose. Devils man of the match: Joey Martin. Cardiff Devils captain Jake Morissette. Pic: Richard Murray. Panthers earned an overtime win against Giants in Nottingham on Sunday. Belfast were playing a third match in three nights and finished with five points from a possible six. Kendall McFaull’s put Giants ahead after 12-13, while Alex Guptill tied the game with 1-44 left in period two. The visitors regained the lead when Dustin Johner scored on 41-17 before Ollie Betteridge made it 2-2 (44-11). Both teams take a point because the score was level after regulation time, but Panthers gained an extra point because Brett Perlini fired the OT winner at 62-21. Glasgow Clan scored an overtime winner to beat Stars. Clan who opened with just over eight minutes gone through Gerard Hanson. Stars were level at 10:30 with Charles Corcoran netting, but with 61 seconds left in the opening period Guillaume Doucet put the visitors back ahead. Stars needed just 2-26 in the second to draw level, Lukas Lundvald the scorer to make it 2-2. A powerplay late in the period for the Stars saw them take the lead for the first time in the game when Matt Marquardt scored (36-17). Hosts Dundee looked to be heading for a regulation win, but a Scott Tanski equaliser with 2-30 left snatched an equaliser for Clan. The visitors then took the extra point in overtime, Matt Beca coming up with the winner 1-14 into OT. Former Cardiff Devils player Bari McKenzie is now playing for Fife Flyers and scored their winning goal against Manchester Storm. Steelers secured a four-point weekend. Tanner Eberle at 3-49 and Eric Neiley on 18-56 put Sheffield on top and Neiley made it 3-0 (37-42). With just over nine minutes to go, Blaze hit back through Alex Nikiforuk and then with 3-11 left, he fired in again to suddenly bring the Blaze back to within one. Jonas Westerling found the empty net after 57:58 to round off a useful road win for Steelers. Former Cardiff Devils forward Bari McKenzie scored the winner for Flyers. Danick Gauthier (5-57) put Fife ahead and Dane Byers made it 1-1 (12-35). The Scottish forward McKenzie struck after 38-33 and that proved the winner.